One of my favorite aspects of food blogging is the community. I had never thought that by signing up for a blogging platform and sharing my recipes and ideas that I would end up making so many friends from all over the world. The community is so strong and is growing as we speak. Pinterest, Twitter, Instagram, Facebook groups. If you’re a foodie you will inevitably find other foodies. And so I did! One of the Facebook groups I participate in, called Food Bloggers Central, decided to organize a Blog Hop where we would share each others recipes on our blogs. I immediately signed up! What a great way to not only support each other’s work but also make a recipe that I would have never thought of making before. 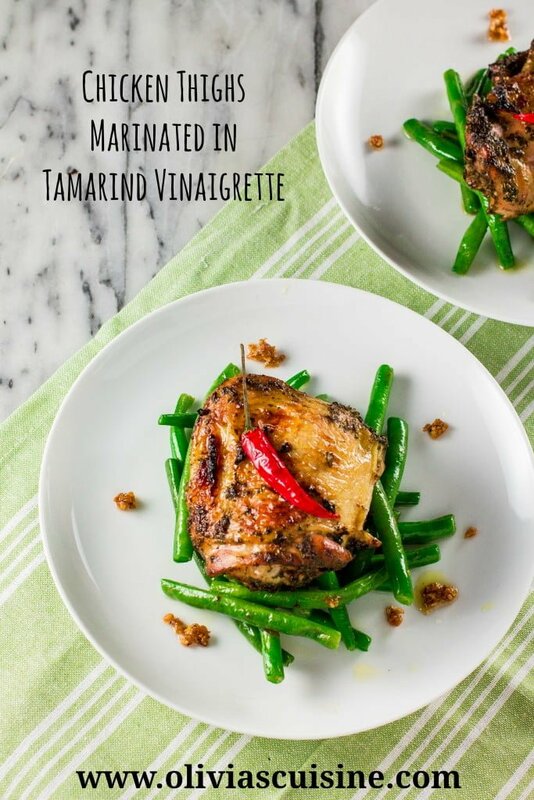 I was assigned the fabulous Germaine from Sun Temple Food and after spending some time on her website, I chose to adapt her recipe for Chicken with tamarind vinaigrette that turned out to be my version of Chicken Thighs Marinated in Tamarind Vinaigrette. Germaine’s blog focus in healthy and nutritious food. She shares some amazing recipes, many of Caribbean influence, as that is where she lives most of the year. I highly encourage you guys to take a peek at her website and support her work! While Germaine is lucky to have access to fresh tamarinds – she has a tamarind tree next door – and therefore can make her own tamarind paste, I had to brave through the grocery store and all I could find was Tamarind chutney in the Indian ingredients section. If you have access to fresh tamarind pods and want to make your own tamarind paste, like Germaine, please find her recipe for tamarind paste here. However, I found the Tamarind chutney to work perfectly! Its tanginess and sweetness added so much flavor to the chicken! I liked it so much that I ended up raising Germaine’s 1 Tbsp of tamarind paste to 2 Tbsp of Tamarind chutney! The original recipe also asks for chicken breasts and for cilantro. Well, I’m one of those people that has a genetic aversion to cilantro, so I substituted it for parsley. As for the chicken, since I was going to roast it in the oven, I opted for skin-on, bone-in chicken thighs as I really love how juicy and full of flavor they are. As for the heat, I added a small red chili pepper to the vinaigrette. It was the perfect amount of spiciness, as me and my husband are not into crazy hot foods. My husband described it as “spicy but not too spicy”, which is perfect for us! If you like extra spicy food, you could probably add two or three chili peppers. 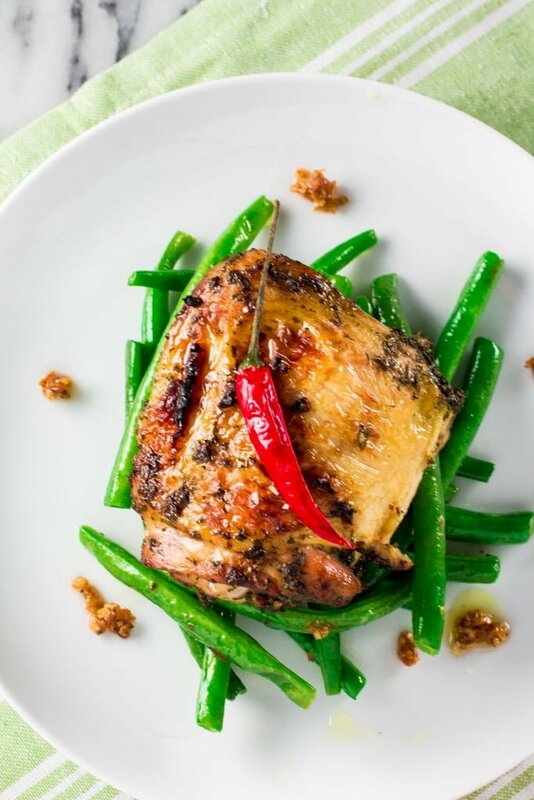 I served the chicken with some garlicky green beans, but you can serve with any vegetable of your preference, salad or even with rice and beans! I’ll definitely be making this again! I hope you guys enjoy it! Combine all the ingredients, except the chicken, in a food processor. Process it until the consistency of a paste. Transfer the marinade to a resealable plastic bag and add the chicken, tossing it around so it gets coated with the marinade. Seal the bag and marinate the chicken in the fridge overnight. Preheat your oven at 375F degrees for at least 15 minutes. Remove the chicken from the marinade and transfer to a baking dish, skin side up. Bring it to the oven for 30 minutes or until the chicken is cooked and the skin is brown and crispy. Adapted from Sun Temple Food. Girl this looks so delicious! I love adding tamarind paste in my gravies but never tried this way! My mouth is literally watering hehe! Yum! I’ve never had tamarind with chicken before and it sounds fantastic. I’m with you on the cilantro – I have the genetic aversion too. Every day a new delicious recipe! This recipe looks amazing and I’ll try to add tamarind in my next cooking! Such a beautiful delicious dish! Mmmm – I could really go for this right now! You are so right! I love the blogging community! It is so supportive, and such a wonderful things to be a part of! And these chicken thighs! Love!! oh yumm! Olivia, this chicken is making me hungry! Love the idea of tamarind vinaigrette. genius! I agree, blogging is awesome, there are so many things you discover when you start blogging and so many nice people you meet who share the same interests with you opening a lot of opportunities to learn something new and exciting every day! 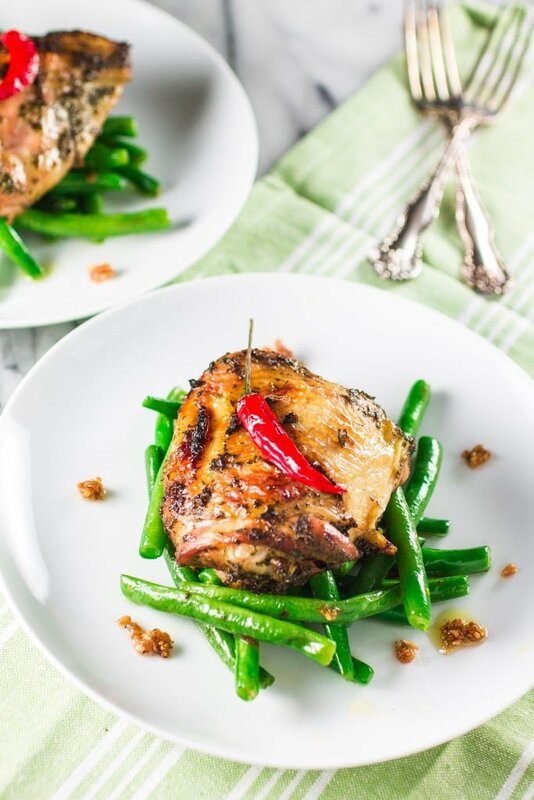 Delish chicken & easy to make, I have to try this one, it’s the kind of dish my family enjoys! This is my type of dish! Love it! And I also enjoy blogging ! I don’t recommend substituting tamarind paste for tamarind chutney or at least not on a one to one ratio. It was super bland.